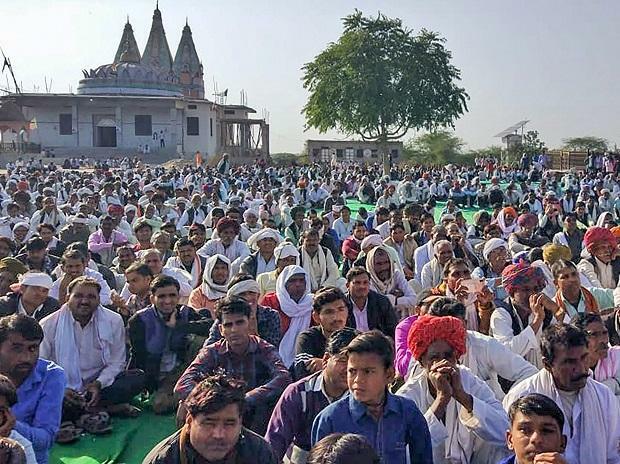 The members of the Gujjar community continued to block railway tracks and highways in Rajasthan for the eighth consecutive day on Friday, despite the state government releasing a notification to give 5 per cent reservation to them and four other agitating communities. State Tourism Minister Vishvendra Singh and representatives of the Gujjar community held talks to end the deadlock, however they remained inconclusive as the Gujjar leaders demanded written assurance from the government that necessary steps would be taken if their demands face legal hurdles. "We had a meeting with the minister. We have asked for a written assurance from the government that it will take necessary steps if the bill fails to stand on its feet. The Congress had promised 5 per cent quota in the election manifesto and not a bill. Tomorrow, the government will provide us a draft document after which we will take further decision. Till then, dharna will continue," Vijay Bainsla, son of Gujjar leader Kirori Singh Bainsla told PTI. The ongoing dharna led by Kirori Bainsla on railway tracks and highways has inconvenienced travellers. As per the North Western Railways spokesperson, 64 trains have been cancelled, 71 diverted and 32 partially cancelled in the last eight days. The West Central spokesperson said 148 trains were cancelled, 143 diverted and 52 short terminated. Bainsla and his supporters began their sit-in on the railway tracks in Malarna Dungar area of Sawai Madhopur district on February 8, demanding 5 per cent quota for Gujjar, Raika-Rebari, Gadia Luhar, Banjara and Gadaria communities in jobs and education. The Rajasthan assembly on Wednesday passed a bill giving 5 per cent quota in government jobs and educational institutes to the Gujjars and four other communities agitating for it. The Gujjar agitators are sitting on Mumbai-Delhi railway track near Malarna Dungar and Sawai Madhopur-Jaipur rail track at Chauth Ka Barwara in Sawai Madhopur district.